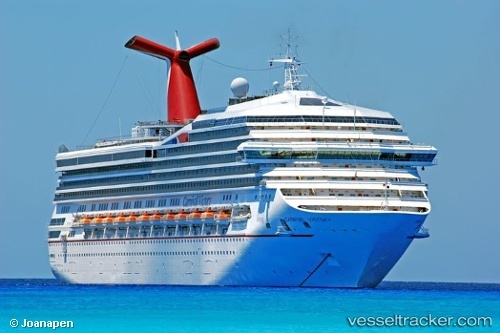 The "Carnival Victory" lost power for several hours on Feb 28, 2019, around 5 p.m. A generator was started, but the ship remained drifting without propulsion for several hours. She was on a four-night Western Caribbean cruise, having left Miami on Feb 25 bound for Key West, Florida. The cruise ship called on Cozumel on Feb 27 and was north of Cuba at the time of the power failure, being scheduled to arrive back in Miami on March 1 at 8 a.m. Power and all services have been fully restored short time later, and the ship continued on the way to Miami, having increased its speed from around 11 knots to 20 knots. The US Coast Guard was searching for Thomas McElhany, a 26-year-old man, who went overboard from the "Carnival Victory" at FLorida Keys 35 miles south of Islamorada on Dec 14, 2018, 35 miles south of Islamorada. The Coast Guard 7th District command center received a call from the cruise ship stating a passenger had reportedly went overboard. Coast Guard asets searching were: A Coast Guard Air Station Miami MH-65 Dolphin helicopter a Coast Guard Air Station Miami HC-144 Ocean Sentry the Coast Guard Cutter "Charles David, Jr." (WPC-1107) the Coast Guard Cutter "Charles Sexton" (WPC-1108), the Coast Guard Cutter "Cochito" (WPB-87329). The cruise ship’s next port of call was Miami where it called at 8.45 p.m. the same day. The search was suspended on Dec 15. Crews had searched for approximately 32 hours covering 2,086 square miles. Carnival Cruise Line’s new Carnival Radiance is to offer Mediterranean voyages and the company’s first Cuba sailings from the US ports of New York, Norfolk and Port Canaveral when she launches after a US$200 million dry dock in Cadiz, Spain in 2020. Currently sailing as Carnival Victory, Carnival Radiance will be renovated and relaunched on 29 April 2020 with a 10-day Mediterranean voyage from Barcelona, Spain to various destinations in the region. The ship will then embark on a 13-day transatlantic crossing from Barcelona to New York to begin her inaugural season in the city. Once in New York, Carnival Radiance will offer a series of cruises to Bermuda and the Canadian ports of Saint John and New Brunswick, as well as the line’s first New York-Cuba voyages. The latter itineraries will include overnight stays in Havana and The Bahamas. The vessel will then repositioning to Norfolk, Virginia to offer additional voyages to Cuba.